With numerous varieties of automotive tools on hand, a garage car manual to guide and sparing some time and attention, minor car repairs and its scheduled servicing and maintenance works can be undertaken easily by anyone at his automobile garage at home to maintain an electric car road-worthy and keep it running smoothly. This way one can comfortably save hundreds of dollars on garage expenses annually. Apart from cutting down on costly expenses on professional garage services, one of the most gratifying features of undertaking maintenance jobs on own vehicle is the opportunity it provides in better understanding of the car mechanism so that it is easier to handle in case of breakdowns. A wide range of good quality automobile tools are essential in any home automobile workshop to work on a car. The machining and sizes of parts of cars are not uniform for all models and makes, as certain car manufacturers adopt different types of machining for their cars and in view of this, sizes of parts also vary. It is, therefore, very important to procure certain special car tools from automobile parts stores. These tools are specifically designed for working on a particular type of car. A trolley jack and axle stands are among the two most important items in a home car workshop and without them the workshop is not complete. These equipments are required to let the car owner to get underneath the car to carry out certain maintenance jobs, like changing the deep cycle battery or checking on the adapter plate or electric motor. For many routine jobs, such as changing blown fuse, battery connector, wire connectors, brake pads etc. on your homemade electric vehicle, all-purpose tools, like a wrench and a screwdriver are quite sufficient and practically, all hardware stores stock these small tools. It is advisable to keep automobile tools separate from other normal tools so that these tools will be handy when car maintenance work is taken up. This way maintenance job can proceed smoothly without any disruptions or delays. If you are using a conventional automobile, it was comparatively easier to maintain cars and get familiarized with their mechanism than at present. With a DIY electric car, maintenance can be a bit tricky especially if the problem is caused by the controller. It is, therefore, necessary to have special electrical problem-solving tools to check and fine-tune the controller and electric motor on your EV. Routine maintenance of internal and external components of your electric car in actually fact is not difficult and it could be carried out by anyone. Removal of scratches, dents and panel beating are fairly simple jobs to undertake in a home garage. While a soft hammer is useful for panel beating, abrasive paper, spray paint and filler are necessary for spray painting work. For small scratches on your car body paintwork, you can use the Quixx paint scratch remover. If the car is used regularly for a long period and the interior looks worn out, it also requires some attention. Fortunately, plenty of car upholstery tools are available in the market that can be used to refurbish the interior of the car and restore it to its original dazzling condition. Small slits and burns on the seats can be repaired by darning them or pasting repair patches over those places. While the luster of the car can be restored with a good polish and a polishing brush, certain specialized tools are necessary for repairing the carpets or even substitute them, if required, with good ones. It is obvious that owning and maintaining an electric car is not only mere tightening of nuts and bolts and stitching ripped seams, but also involves adding certain specific parts, like a more efficient high torque electric motor to durable deep cycle batteries. When fundamentals of car maintenance are properly understood, its upgrading and tuning will become more comprehensible, thereby saving lot of money in the long run. 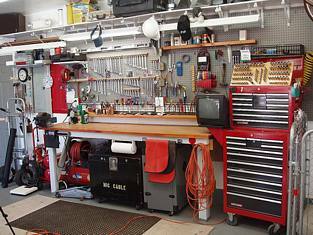 The best method to save valuable time, effort and lot of money on car repairs is to keep the right automotive tools in the home garage and carryout small jobs on our own. However, it is also very important to bear in mind that one should acquire enough knowledge on cars so that he can decide when to seek the services of a professional mechanic from an outside workshop or otherwise, ignorance or insufficient knowledge will lead to more damage than good your electric car.